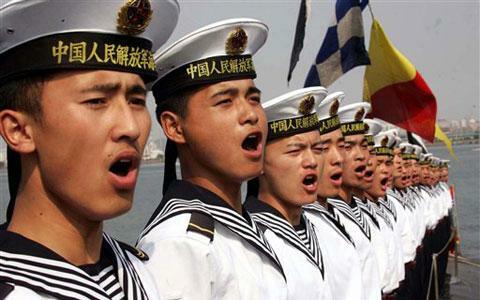 Reading last week about the joint Russian-Chinese naval exercise “Maritime Cooperation 2012” in the Yellow Sea, I was interested to learn that the Russians insisted bridge-to-bridge and exercise communications be conducted solely in Russian. This is further indication that the exercise, the largest for the two navies since 2005, is a sign of normalizing ties rather than of a burgeoning alliance. The pair had at first agreed to use both Chinese and Russian, but interestingly the Chinese acquiesced to Russian demands. Perhaps it was a simple lack of Mandarin speakers in the Russian fleet, but this seems unlikely given the effort each side takes to monitor the other’s activities. I was also curious, but not surprised, that neither side pushed for a compromise use of English. Undoubtedly some of these mishaps are due to language comprehension difficulties – not a surprise if you can imagine trying to understand a heavily accented, non-native speaker trying to communicate something in a panic. The IMO has studied requiring a standardized Maritime English-language competency test as an amendment to its 1978 Convention on Standards of Training, Certification and Watchstanding, but so far has only posted guidelines. Despite the growth of Chinese naval and commercial shipping prowess, I don’t foresee China pushing for Mandarin to rival or replace English as an official maritime language in the foreseeable future. Nonetheless, I do expect the PLAN to become more insistent on Mandarin’s use in joint exercises when its partner speaks a similarly non-English tongue.